After years of trying times and heartbreak, the Texas A&M University–Commerce Lions football team has assured themselves of at least a share of the Lone Star Conference title for the first time since 1990. With a commanding 48-21 win over the West Texas A&M Buffaloes, the Lions look to finish the season strong in order to pave the way for a playoff appearance. The action on Saturday began even before the opening kickoff, as a cannon was brought onto the field and fired before the start of the game, as well as with each Lions’ score. The individuals manning the cannon would be quite busy all night as the Lions, after a rocky start, got the momentum rolling in the second half and then cruised to the win. After a first quarter when the Lions controlled the tempo with 11:29 of possession time as opposed to the 3:31 by the Buffaloes, the Lions still could only muster nine points, a rarity for this season. Things got dreary in the second half when penalties on defense helped WT march down the field for two scores, putting the Lions in a trailing position for only the fourth time this year. It was then when A&M–Commerce truly brought the heat. After the Buffs’ go ahead score, the Lions scored almost immediately on a 61-yard strike from Tyrik Rollison to Ricky Collins. What happened next, however, is what got people really on their feet. On the ensuing kickoff, head coach Colby Carthel reached into his bag of tricks and called for a surprised onside kick, one which the Buffaloes seemed woefully unprepared for. The Lions successfully recovered the kick and began a drive towards the end zone, where the Buffs defense stopped them cold at the five-yard line, forcing the field goal unit to enter the field. Not content with settling for three, the Lions once again got creative and after receiving the snap, holder Trever Lasseter stood up and tossed a shovel pass to a wide open Theo Wofford for the touchdown, putting the Lions up 23-14 at the half. The Lions seemed to gain a boost of energy after the successful trick plays, as they came out of the locker rooms for the third quarter and proceeded to score 25 points in the 15-minute frame. The defense was once again manhandling the Buffaloes’ offense, but continued to rack up penalty yards. The penalties did not come back to haunt them, as they only allowed seven points in the second half. Statistical leaders for the game included quarterback Rollison, who threw for 355 yards and three touchdowns, and Collins, who compiled 153 receiving yards and two scores. The Buffaloes did outrush the Lions however, with running back Geremy Aldridge-Mitchell gaining 160 yards and two scores. Defensively, the Lions made a habit of pestering the Buffaloes 6-7 quarterback Preston Rabb, with the defense snagging three interceptions, as well as two more that were ultimately called back due to penalties. Charles Woods led the team with 16 tackles, but a shining defensive star on the night was junior linebacker Cole Pitts, who made 10 total tackles, with 3.5 tackles for a loss. Pitts snagged his first career interception and ran it 50 yards for his first career touchdown. His efforts earned him the Lone Star Conference Defensive Player of the Week honors, making him the fifth Lion, as well as the third defensive player, to earn conference player of the week honors this season. Carthel was happy to get the win, but acknowledged the abundance of penalties the Lions garnered in the win. As the Lions look to next weekend, when they will travel to Wichita Falls to face the Midwestern State Mustangs, they realize there is a lot on the line with this game. The Mustangs are coming off of a rejuvenating win over McMurry University last weekend, which broke a two-game losing streak. The Mustangs were nationally ranked as high as 16th before the two-game skid, and the now 22nd ranked Lions look to end the Mustangs’ hope for a share of the championship. Midwestern currently sits in a quagmire in second place in the conference with four teams tied with 3-2 conference records. A win by the Lions will secure sole possession of the championship, which makes this game a key matchup. The Mustangs are led by an extremely balanced running game, with multiple threats on the ground, including quarterback Jake Glover, currently second on the team in rushing. The defense is solid as well, with safety Marqui Christian leading the team with 50 tackles on the season. 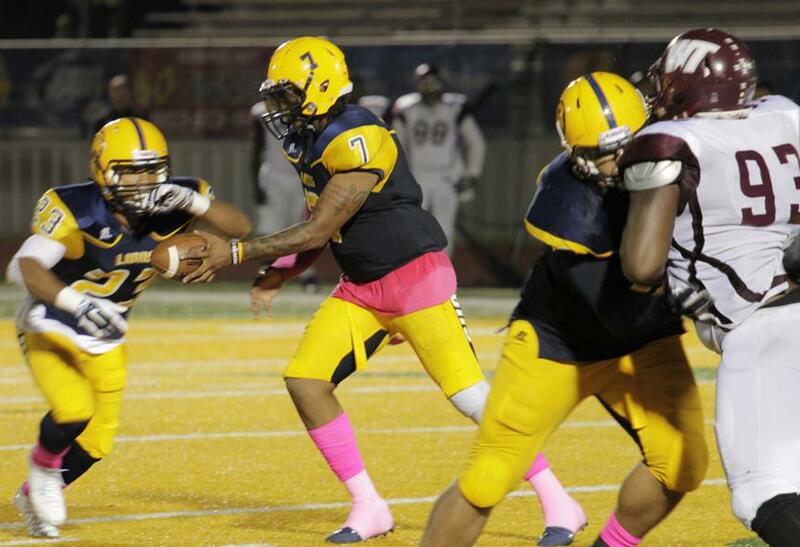 The Texas A&M University–Commerce Lions will play the Midwestern State University Mustangs at Memorial Stadium in Wichita Falls, Texas on Saturday, Oct. 25 at 7 p.m.